Feature Story: Home Sweet Home | Home Style | Style Weekly - Richmond, VA local news, arts, and events. "It's always our Christmas present," Hunt says. "We know that her recipe is top secret, so that's why it's such a treat. It's addictive, especially when it's first made and the butter and almond melt in your mouth." After deciding that candy would be her holiday gift to friends, Nicol tested out various recipes, giving away boxes with an assortment of candies. It wasn't long before friends suggested she focus on the toffee. "They told me it was the best and to give them that alone," Nicol recalls. "People started to expect the toffee each year." Seeing the popularity of his wife's toffee, Nicol's husband, Rob, encouraged her to think about starting a cottage business, selling the candy to retail establishments and also to the public. Nicol, who was working at a full-time job at the time, only toyed with the idea. Then in 1996, her husband died of a heart attack at the age of 47. On her own, Nicol began to seriously consider starting a company. A friend asked her, in the fall of 2003, to make a huge batch of toffee for an office party. Nicol was unemployed. She recalled how Rob had urged her to sell the candy. "Rob was my inspiration," she says, a tender smile showing. "I started selling the candy, and it took off from there. It's grown by word of mouth." Nicol's bridge partners have been supportive of her venture. "We thought if anybody can make a go of a cottage business in candy, Marilyn can," Hunt says. "We didn't know she was going to name it Nicol Candy. We just refer to it as great toffee." A graduate of Virginia Commonwealth University with a degree in fine arts, Nicol combines her creativity and passion for art in her home and her work. Her two-story colonial house bursts with color  plums, peaches, "happy colors," she says. Her kitchen  heart of the Nicol Candy enterprise  flows into a Florida room that floods the area with intense morning sun. Faux-painted walls are splashed with a melon color that stands in stark contrast to the room's white columns, cabinetry and ceiling. In the kitchen window, a colorful, whimsical mobile dances in circles. Nicol has positioned a round iron-and-tile table and chairs boasting plum, brown and yellow colors in the back corner of the Florida room. She bought the set at a craft show. "I actually designed this addition around the table," she says, pointing to the design of the tile. One segment of the kitchen  shelves and a desk  holds Nicol's playful collection of pig statuary. Flying pigs hover over the desk. Higher up on the shelves are beloved photos of her late husband and her 16-year-old daughter, Casey. Her office  Nicole Candy central  also holds family mementos and more pigs. The room's plum-colored walls contrast with the white ceiling. An oversized painting of a white orchid by Michael Gerry towers over the desk. In the last couple of years, Nicol has taken steps to increase the awareness of her toffee by participating in events such as Bizarre Bazaar and Daisy Days at St. Catherine's School. 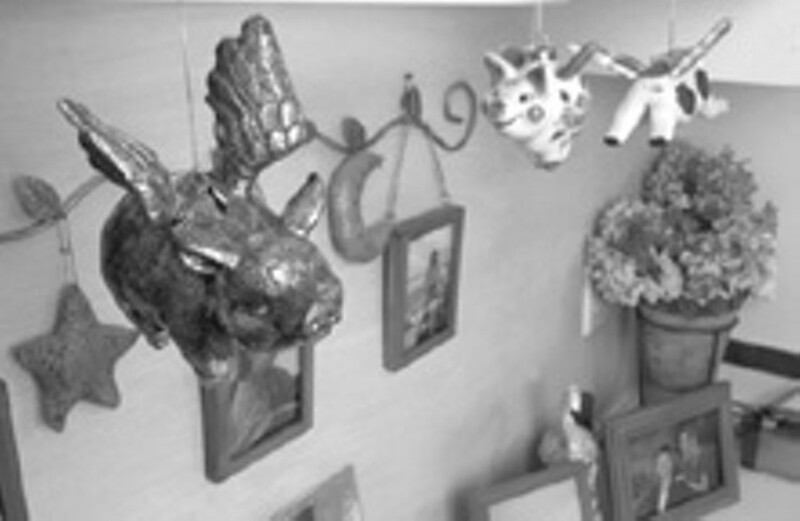 That's where she met Sharon Coleman, owner of Tinker's, an eclectic home décor/gift boutique. Coleman is now selling Nicol Candy in her shop. "I thought it would be a seasonal item for Christmas, but people like it so much that I sell it year-round," Coleman says. "It's the only food item that I sell." Coleman's a fan herself. "I challenge anyone to find a fresher, better-tasting toffee on the market," she says. Because it contains only four ingredients  sugar, butter, almonds and semisweet chocolate  the candy is popular with Coleman's customers who have problems with gluten products or who have celiac disease. "This is their standard sweet because it has only four ingredients, and it keeps really well," she says. "People who aren't real candy lovers like this because it's sweet, but not gooey sweet," Nicol says. "It's like potato chips in the respect that you can't eat just one piece." Cooking and preparing each batch of toffee takes almost two hours. But "packaging takes twice as long," Nicol says, pointing to the gold boxes neatly tied with plum or teal sheer organza ribbon that are stacked on her desk. "I do it all by hand," she says. "I break up the toffee in odd pieces and layer it in the box so it fits like a puzzle. That's when I get to use the creative side of my brain." Working from home is a joy, she says: "I love the independence and the discipline. I feel that I am an organized person, but this helps keep me straight." Because she sells the candy, Nicol's kitchen is inspected by the health department. "They have to see the recipe and how I cook it, the temperature, et cetera," she says. Nicol is in the process of contacting more small retail stores and trying to decide whether to branch out to gift shops in Williamsburg and Northern Virginia. "I don't want to get into the mass market because I want for the candy to be something special," she says. Until her business grows, Nicol is working part time at Friends Association for Children, a nonprofit child-care agency, where she serves as volunteer coordinator. "I wanted to work part time while I'm building the business," she says.